Literally. It’s not wishful, it’s damn lustful. Now that we’ve finished furnishing the flat, I’m putting aside a little money each month for some lovely beauty things that have been catching my eye recently. It’s only fair that I be rewarded for my diligence, stiff upper lip and horrifying withdrawal symptoms, no? 01: Burberry Lip Velvet in Bright Poppy (£22.50) – I’m not sure if they’re out yet but these matte lipsticks promise to throw away the rule book when it comes to matte lip texture. Hydrating? I’ll believe it when I see wear it. 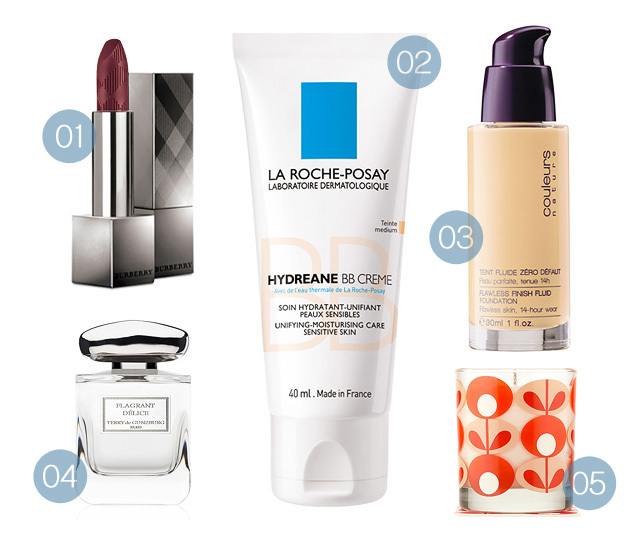 02: La Roche Posay Hydreane BB Cream (£15) – Oh, um. HELL YES. A BB cream formulated by La Roche Posay has me salivating at the thought. I’m like a 6yr old on Christmas morning – hoping, praying that what’s under the tree is as good as she hopes. 03: Yves Rocher Flawless Finish Fluid Foundation in Rose 100 (£9.60) – Try saying that after a few. I can hardly say it now (hides the bottle). I tried this one on the back of my hand in the Yves Rocher store in Prague and it looked/felt soooo good but I’d already stretched my no-makeup budget to the max on some eyeshadows AND I’m currently in love with their BB cream (review coming soon!) so I skipped on this. And now I can’t stop thinking about it. 04: Terry de Gunzburg Haute Parfumerie Flagrant Delice (£68) – I wrote about these a few weeks ago but have since had a cheeky spritz of Flagrant Delice on my wrist and I’m captivated. Creamy almond milk and sun-ripened fig make for the most delicious combination that not only I, but Leila too have fallen in love with. She says it’s a very “mummy” smell which I’m taking to mean that it makes her feel as downright comforted as it does me. Honestly, such a beautiful and lingering scent. Wantsies. Can’t affordsies! 05: Orla Kiely Geranium and Myrrh Candle (£24) – I do have a soft spot for Orla Kiely, I know that those bloody designs are everywhere but, c’mon… they are brilliantly retro and modern all at once. I was actually hoping I’d prefer the scent of the lime green design, seeing as that would have been the one to match my decor. But in typical sod’s law-style fashion, it’s the Geranium & Myrrh in resplendent red that I’m lusting after. What lovely things have you been lusting after recently? How funny, I’m also about to post a wishlist in a few hours. Wow that BB cream looks good. Since you’re an Orla Kiely fan you might want to check out Uniqlo. They have an Orla Kiely collection in at present which is DIRT cheap. £10 for a scarf, and £15 for a top! Oh goody, what a fab sister. I have been greedy and kept 2 scarves and two tops all to myself! I don’t blame you – I was really tempted by one of the tops but I was worried it would look pants, might go back for a scarf for myself though! Which colours did you go for on the scarfs? I got the blue/grey/taupey one for sis. They look so good! I got the navy car top, and the “standard” graphic beige print. Scarves I got the beige “standard” and the browny shade too. I was tempted by the blue, but couldn’t justify 3! I was so lucky as I went to Westfield and there was nada, but luckily Oxford Street had tonnes. Well that red candle will look perfect with your green decor – a little pop of contrast. Tres festive. Perhaps someone will buy you it for crimbo? Can’t wait to hear about the YR BB! Beauty or a Philips Airfryer, can’t decide between chips and makeup tbh! Please review the Yves Rocher items soon. I’ll be in Prague in less than a month! Would also love to know any stand out beauty/perfumey stores to see while I’m there.